CAD Audio is now shipping its installation-grade UHF WX100 Wireless Series system. The UHF WX100 offers simple and intuitive operation along with reliable wireless connectivity in the most congested RF environments and exceptional audio bandwidth, the company says. In addition to enhanced connectivity, the WX100 features a familiar control scheme that facilitates problem-free operation by non-professional users. The transmitters are designed with straightforward form factors that make it easy to identify various features, operate on/off switches, change and recharge batteries. 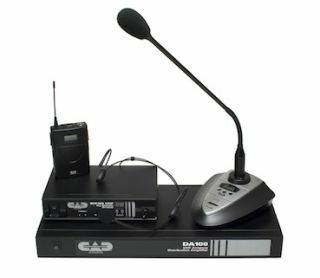 Basic system components include the WX160 gooseneck desk stand transmitter and WX100 receiver, the handheld WX150 microphone and the WX155 body pack which can be used with the CAD 301 cardioid lavalier mic or CAD 302 headworn microphone for additional flexibility. The WX100 is supplied with a joining plate and rack ears for easy installation.